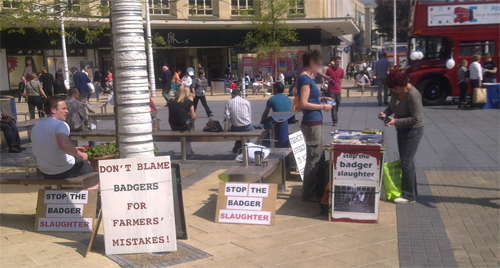 If you’re new to animal rights, a great way to get involved and learn a bit more, is to do an information stall with one of us. We aim to do these stalls as much as possible. We normally do these in Broadmead, and sometimes Bedminster or further afield. We also do stalls at community events. We aim to do them most weekends, and often mid week. Contact Us if you are free to do stalls! One of the most simple ways to reduce cruelty to animals, is to stop eating them! This is the message we put out on our vegan food sample stalls, where we have a range of tasty treats for the public to try. We chat to a range of the public about being vegan, and have had some great feedback from people who have become vegan since coming to the stalls. We aim to do these stalls monthly, and change the locations. Keep an eye on our Upcoming! page for the next vegan food stall date. We’re all busy doing other stuff at the moment, and so Bristol Animal Rights Collective isn’t meeting or organising actions.